Nowadays, whenever I travel, I noticed a new trend that is catching up. People will bring along their toy(s) and carry it with them into the cabin. Then I realised that I have been doing the same thing, except that mine is not literally a toy. Mine is a green wechat soft pillow that I bring anywhere so that I could rest my little head on it whenever I wish to. The trend is called Nui-Dori or ToyTravel. Catching on the latest trend, Canon partners with the much-loved Rilakkuma to artistically incorporate the latest trend of ToyTravel in a creatively enhanced photo among social media users. 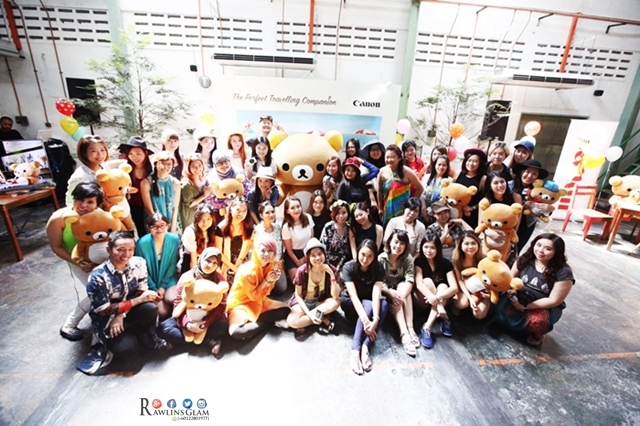 With such intention, Canon Marketing (Malaysia) Sdn Bhd officially launched the Canon EOS M10 x Rilakkuma bundle, which comes with a 24cm Rilakkuma plushie, and a Canon EOS M10 (with EF-M15-45mm) kit lens. "Combining Rilakkuma, a popular character, with Canon EOS M10, the lightest camera in the compact series, we hope to bring ToyTravel to every fun-loving social media user dan photographer out there and make their next travel adventure a more memorable one. With the sleek and chic EOS M10, users will be able to capture superior quality photos and videos for sharing on social media platforms," said Ms Sandy Lee, Senior Marketing Manager for Consumer Imaging and Information Division of Canon Marketing (Malaysia) Sdn Bhd. Wanna know the price? The EOS M10 kit (with EF-M15-45mm) is priced at RM1,999, but the EOS M10 x Rilakkuma bundle will set you back RM2,049. Lack the cash but your burning desire to have EOS M10 is growing bigger? 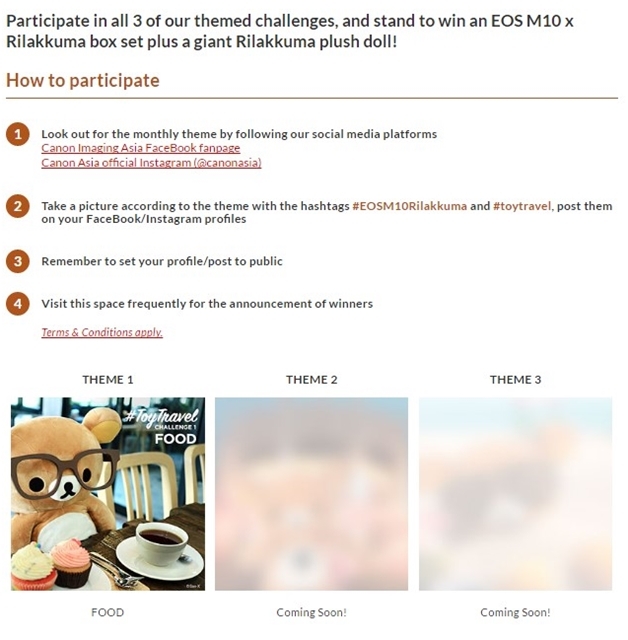 Fret not as there is on-going contest organised by Canon and the grand prize is none other but the EOS M10 X Rilakkuma bundle! This is a sure win for those who love to take pictures anywhere anytime. Just head on to the webpage (Snapshot Canon Asia) and participate in all 3 themed challenges. so cute la Rilakkuma. would love to join in this contest! You're so lucky in winning that day! :D I'm joining the contest, hoping for luck to win..and now, rilakkuma will be my new toytravel! I saw so many post on this ler.. looks like everyone had fun! I want one Rilakkuma!!! Omg! I want to join this bro! So cute!!!!! I love that teddy bear! So cool u won the prize too! 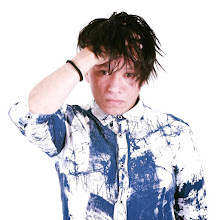 Congratz! it's always great to travelling. and you had Rilakkuma as your travelmate :) so nice!